went up together. Soon after dinner went over to the capitol where we met Mrs Sale and called on she who used to be Ann Palmer. Ott, Will, and I went upon top of the building. The view was grand. After leaving Mts Palmers came down and got Hatties curtains at the cleaning rooms and went to the depot. Ott & Willie both came down there. What a visit we have had. We got an excellent supper at Grinnell. Seth met us at the depot and we were soon home and in bed. Friday March 20th 1896 Got up early and done the morning work. Seth went down for wood. Will and I took in some things to Mrs Rich and went over home to dinner and to tell them about our visit. I came back to the missionary meeting at Mrs McCords. It was late when we got home. Did evening work and went to bed early. weather raw and cold. 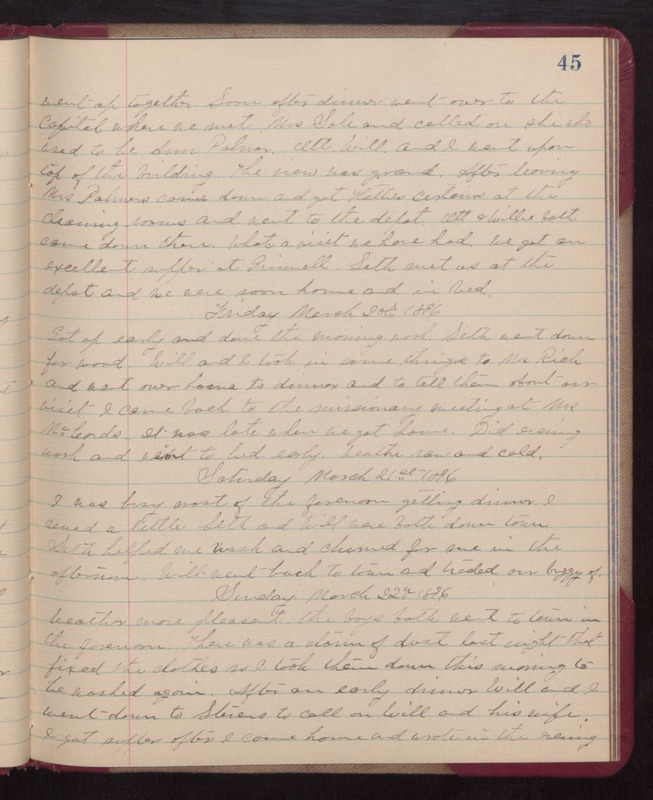 Saturday March 21st 1896 I was busy most of the forenoon getting dinner. I sewed a little. Seth and Will were both down town. Seth helped me wash and churned for me in the afternoon. Will went back to town and traded our buggy of. Sunday March 22nd 1896 weather more pleasant. the boys both went to town in the forenoon. There was a storm of dust last night that fixed the clothes so I took them down this morning to be washing again. After an early dinner Will and I went down to Stevens to call on Will and his wife. I got supper after I come home and wrote in the evening.